Looking for a super quick and easy vegan meal? 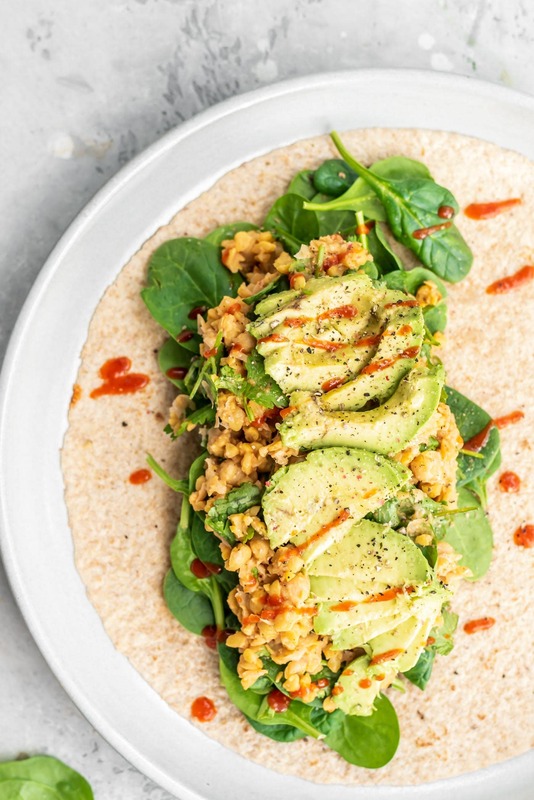 These spicy chickpea wraps with avocado and spinach take just minutes to make but are just delicious! Try them for a healthy packed lunch or simple, plant-based dinner. Chickpea salad is the vegan version of egg salad or tuna salad. 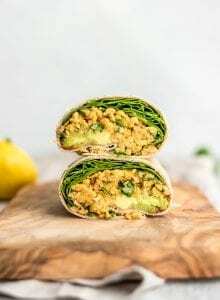 It’s mashed up chickpeas mixed with ingredients like vegan mayo, lemon, celery, red onion, dijon and other egg salad favourites. It can be eaten on its own for a quick snack or meal or piled into a wrap or sandwich made with your favourite bread. For this version, I used just a few simple ingredients: sriracha, vegan mayo, lemon, sea salt, pepper and garlic powder. You can either give the chickpeas a quick pulse in a food processor to break them up or you can mash them in a bowl with a fork or potato masher. This recipe is nothing fancy, it’s very easy to make with common ingredients but the taste certainly won’t let you down. If you need a super quick and easy meal that makes great leftovers too, then this is for you! If you like this idea, you can also try my buffalo chickpeas, chickpea scramble or chickpea “tuna” salad. I served these wraps with a side of oil-free baked fries which went along perfectly with the wrap. 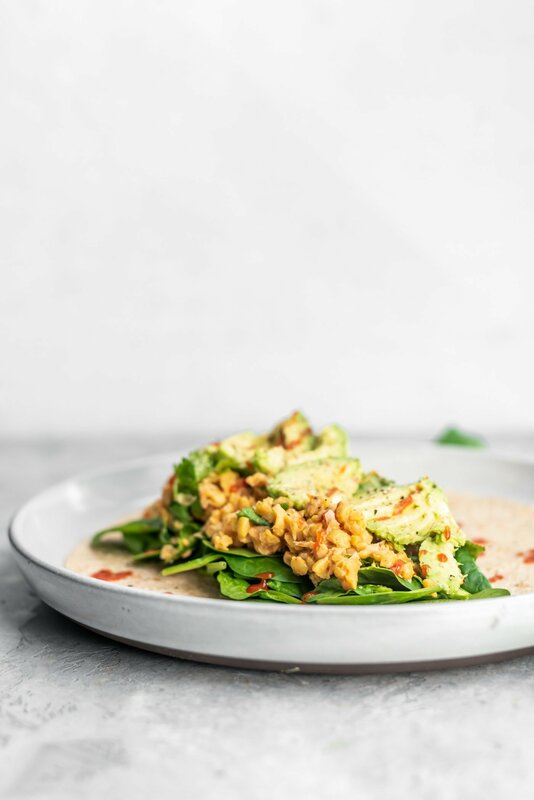 I’d say this meal is a healthy version of going out for pub food, so skip the greasy burgers and deep-fried foods and choose simple but tasty wraps instead. A very quick and easy dinner that’s packs a punch. The chickpea mixture tastes even better the next day so feel free to make that ahead of time and store in the fridge. It’s also great in salads or eaten just as is! Either place the chickpeas in a blender or food processor and pulse until the chickpeas are mostly broken down or mash them in a bowl with a fork or potato masher. It should be chunky but starting to hold together. Combine the chickpea mixture in a mixing bowl with everything except the spinach and avocado. Mix well. The mixture should resemble egg or tuna salad. Adjust the amount of sriracha, mayo and lemon to taste or desired consistency. 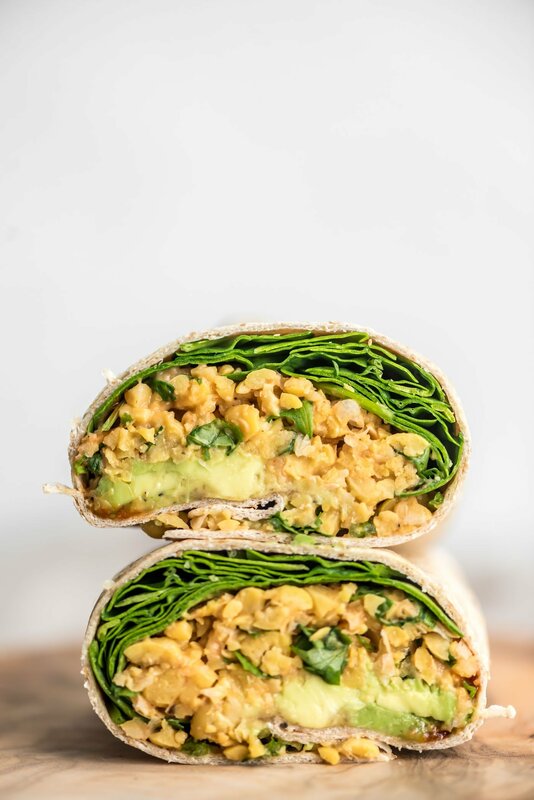 To assemble the wraps, place a scoop of the chickpea mixture into each wrap then top with spinach and avocado. Season with salt and pepper, if desired. Roll them up and enjoy! The chickpea mixture makes enough for 6 wraps but any extra can be stored in the fridge up to three days and added to salads or just eaten as is. You can easily half this recipe to make 2-3 wraps. Sriracha and mayo measurements don’t have to be exact. If you don’t want it spicy, feel free to use less sriracha or omit it and add extra mayo and lemon or try some dijon mustard. I’m wondering if you can make a bunch of these and freeze them? Anyone tried with success? I haven’t tried. I’m not sure how the avocado would hold up but I think it would probably be ok as long as they’re wrapped up well or in a good airtight freezer-safe container. Let us know if you try! 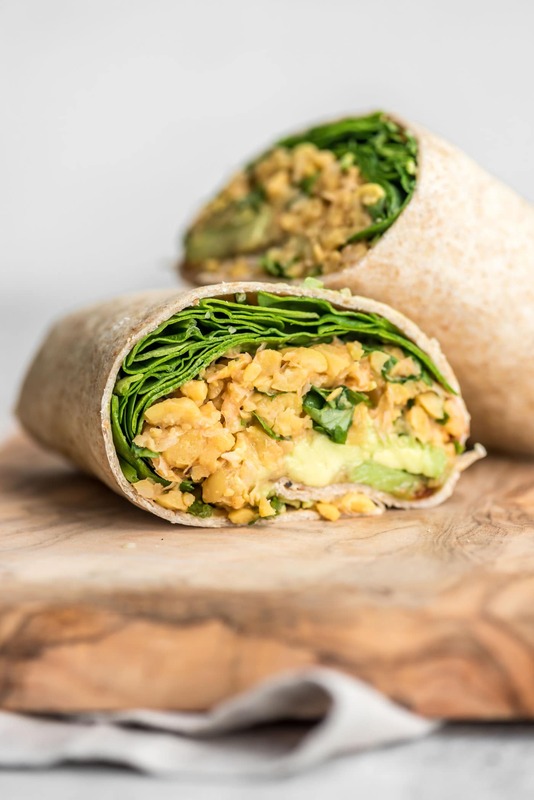 The chickpea mixture can be stored in the fridge up to 5 days and then the wraps can be assembled as needed…if that helps! 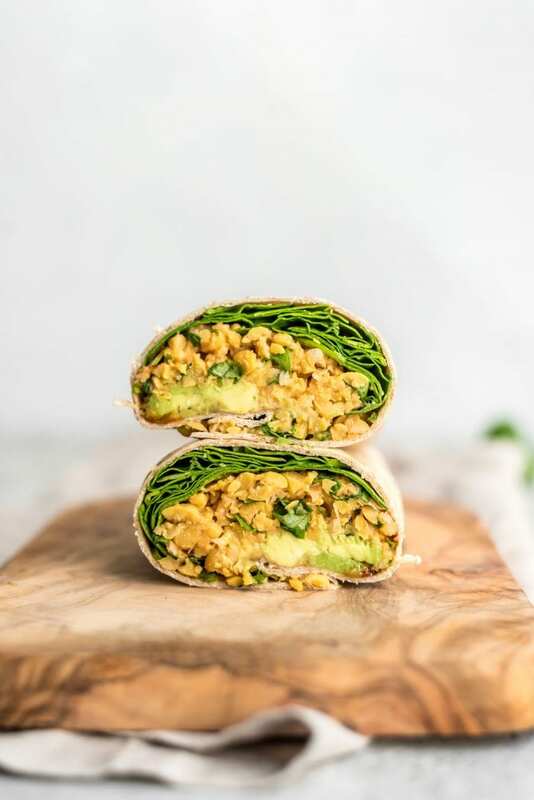 I love a chickpea wrap and this one looks delicious! It could even work in a collard wrap! Love the photos too! Yes, it’s great in a collard wrap too!! Hope you enjoy if you try it. What tortillas did you used? I’m not sure the brand in the photos but I like Silver Hills and La Tortilla Factory. Love your recipes thank you. What tortillas did you use? This was (is) delicious! One of the best wraps I’ve ever made hands down. It’s so easy to make and leftovers taste even better. Thank you so much for this. It will definitely be in regular rotation for lunch &/or dinner. That’s awesome, Michelle!! So happy you liked it. I agree, I love having the leftover chickpea mixture on hand for quick meals, it’s so yummy!